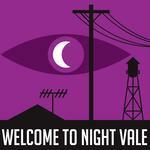 There's a new sheriff in Night Vale, and they want changes. Plus, Cecil runs into a former intern, the court develops some A.I. dragons, and a message about getting into the holiday spirit. Pennington has been working with young computer prodigy, Meghan Wallaby, who is an 11-year-old girl who inhabits what once was the body of a Russian sailor, and also was only born three years ago. But then, the specifics of her identity and her manifestation within time are really none of your business. I absolutely love the Hamilton reference--in this world he became the fourth president after killing Burr. BOOYAH. In other news, I am guessing there's going to be a trial of Hiram episode at some point, given the buildup it's getting? I also loved the Hamilton reference. I had such a stupid huge smile on my face at it! The new sheriff's reaction to the displaced Desert Bluffs residents seemed like some very pointed commentary on the current reaction to Syrian refugees. "I know I'll be sharing some eggnog with my dearest family: Carlos, Abby, Janice ... others." Also, the people appearing and getting closer reminded me of the Strangers in a recent episode . . .where the intern was terrified because the man was getting slowly closer. Anyone remember this?